We have soaps for everyone! Men, women, children, and oh yeah, let's not forget the family pet. There is even a soap to repel fleas and ticks that is 100% all natural, with no chemicals for Fido, too! 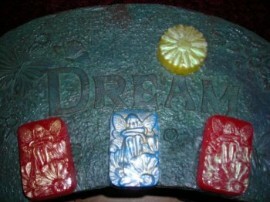 Our hand crafted soaps are molded into many shapes and various styles. From Legos, and puzzle pieces for the children of all ages, to Celtic Knots, Peace signs, and the list goes on so check it out! Every product at Bubbles, Baubles & Wicks is made with skin safe colors, fragrances oils, and essential oils ,there are many from which to choose from so your spa experience can be customized just for you. Forget spending all that money on cans of chemicals that may irritate your skin and are used as fillers. Return to using all natural ingredients that are healthier and have a better value. 3D Knight Soap! 7 ounces of All Natural Glycerin Soap! A must have for your next "Knight" Party :) *GO UCF*! Our 3D All Natural Glycerin Soap - Don't forget to use your helmet-! Relax and enjoy a "Peace"-ful bath or shower! Perfect hand held size of soap customized with your choice of scent! This cute functional puzzle soap comes with four, YES FOUR interlocking pieces! Chose your scent for bath time fun! Lego my soap! YES, we know its mis-spelled but we figured that you'd be addomg all the "g's" you needed when you take a whiff of this adorable soap in a scent you pick out! OR we could surprise you and let us pick for you! Take yourself back to the days of playing Nintendo for hours on end. This Replica of the "Tri Force" is a wonderful trip down memory lane! HOW much more power could you possess! Recharge yourself with an energizing or relaxing bath or shower! Lazy Daisy and the Fairiess sit among the field flowers. Gilded and glowing garnering promises of clean fun! Can one entice you into the water? Here Ye, Here Ye, the Knights of the round table may have been ripe at times but you never need fear. 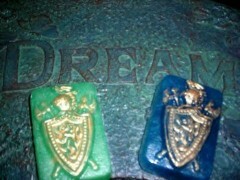 'Ere your coat of arms soap is here! Bouquet of flowers with your choice of scents. Each weighs 3 ounces. You'll never have to stomp down divits when you tee off with these balls! Either 2 round dimpled spheres or a Ball on Tee soap. You'll always be on top of your game! One HUGE soap! Do youself Justice with this Glorious bar of soap emblazened with an American Eagle. This soap is 4.5 ounces big! Perfect for a suprise! Say CHEESE or tell them its a Grin and bear it situation! Choose youre scent and let our nibblers put the BITE on dirt!